perhaps, be paralleled in any other part of the world". or say precisely where they had their beginnings". 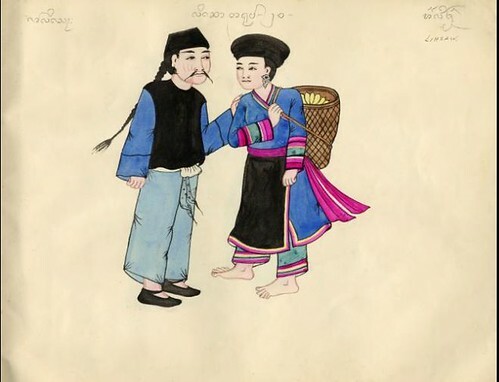 "A Hand Painted Manuscript, in Color, of the Kaw, Lahu, Kwi, En, Ahko, Hpin, Tai-Loi, Yang Hsek, Palawng, Kachin, Wa Lu, Lem, Tai-no, Lisaw, Hkun and Tai tribes. 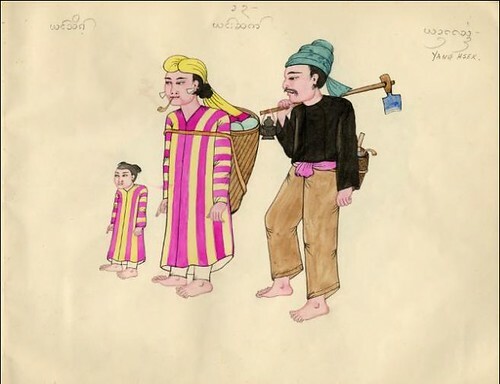 Hand drawn, hand colored ethnographic manuscript showing people from various ethnic groups in Burma at their daily chores and in their native costume, ca. 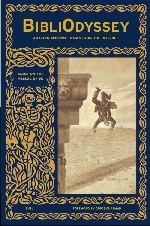 1900." 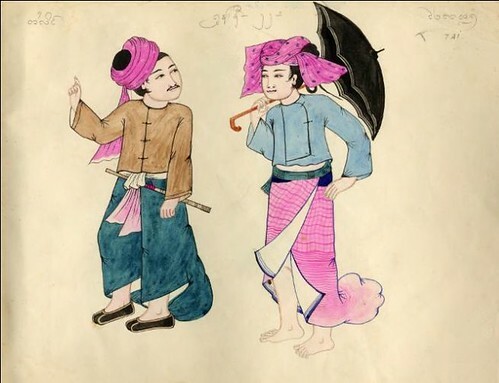 The 'Tribes of Burma' manuscript comes from the South East Asia Digital Library at the Northern Illinois University Libraries, Special Collections. [homepage] All the above images were modestly background cleaned and are screencaps taken from djvu files at 100%. and Cambodia shortly after the ouster of the Khmer Rouge. of sanitation and safe drinking water use remains low. Human rights violations are very common in this population. Nyaunglebin and Toungoo Districts, faced more forced relocation. malnutrition) compared to families free from this abuse. the majority of IDP populations in the eastern conflict zones of Burma. Burma Project/Southeast Asia Initiative (Soros Foundation). Daw Aung San Suu Kyi pages. The 60th anniversary since Burma achieved independence from Britain passed by on 4 January 2008. There doesn't seem to be a great deal to celebrate. Thanks David, great link. I do very much enjoy learning about the technical sides. Same goes for book preservation/restoration - another topic I keep lightly in the back of my mind but hardly ever find good and accessible links about. (will check out the youtube later too). these pictures are so beautiful and colorful. perfect for a gray new england day. Merci pour vos trés belles images et explications. 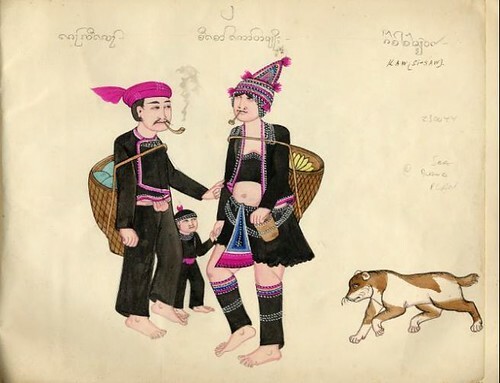 I was going to inquire whether your sources provided any illumination on the prevalence of pipe-smoking among the various ethnic groups (why some are shown with both adults smoking, some with only one, and some with none), but the health/human rights report is too depressing for me to indulge in historical trivialities. PK, wow. I've thought frequently about this post over the past few weeks. I think it's a good application of beauty to social justice. 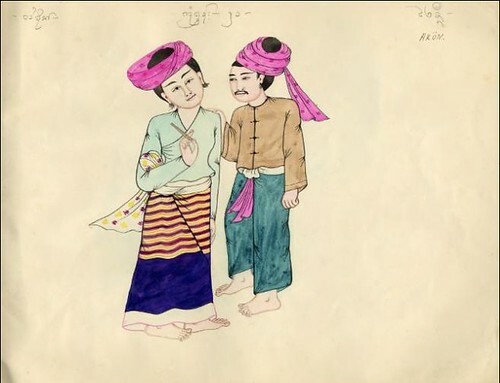 I have several Burmese minority friends (Karen, Jingpho, Zaiwa, Rawang, etc)--brilliant souls--alive to life and better humans than I am, but they and their families and friends have endured enormous humiliation and instability. Your post reminds me of a book I want to read: /On Beauty and Being Just/ by Elaine Scarry. 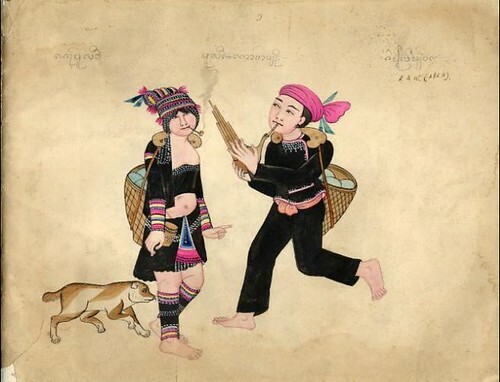 Endangered languages and cultures are also part of the human rights mix in SE Asia/SW China in general. Maybe simple beauty can call attention to such problems more effectively than moralizing dogma and political rhetoric. 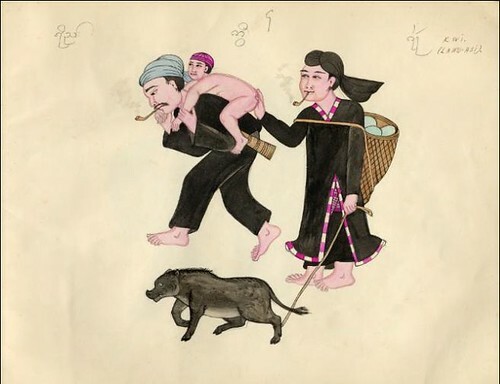 Oh, on the pipe question from karla: I've done a lot of linguistic research on related ethnic minorities in China and pipe smoking varies. 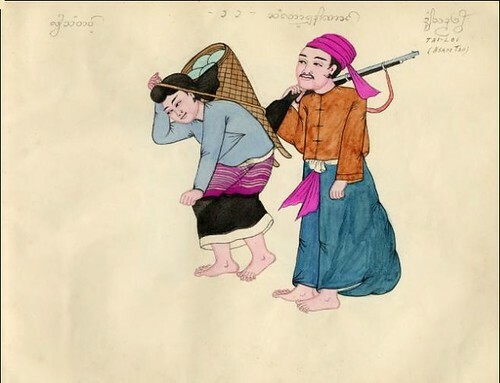 In most groups only men smoke; in others women have special pipes that they stick into their frontispieces (upper aprons) and pull out for a smoke when taking a break in the fields. Thanks JP. I too had been thinking about the pipes. I decided that I thought that they could have been indiscriminately included for so many reasons that I couldn't quite decide which version sounded more plausible to me. Your is as good as any, and probably closer the Occam's Razor position in any event. 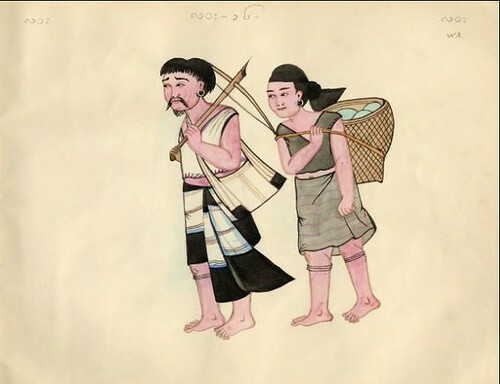 I was fortunate enough to encounter some related tribes (Tay and...I forget which others) in the far north of Vietnam. Gentle, happy folk. It's perhaps a measure of the impotence and futility of an era or the will of the world when beauty can be regarded as an effective means of political commentary/criticism. Oy.